The annual 5K walk event is held in New York City for the past three years. It has become a community event and gets everyone involved to support this compelling cause. It brings people together to share a meaningful common cause. The number of people participating in the walk has grown each year and exemplifies the community concerns about autism. 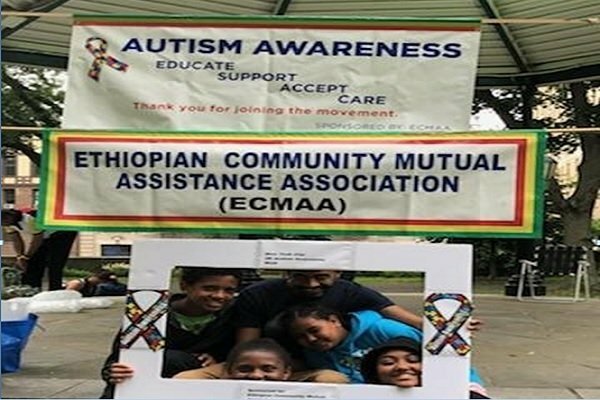 One of the Ethiopian Community Mutual Assistance Association (ECMAA) objectives is to raise awareness and enhance positive cultural identity for Ethiopian community resident in NY, NJ &CT.
On June 10, 2018 ECMAA has organized the 5K walk to increase awareness about autism. The walk started at Sarkura Park about 1:00 P.M. making its way along Riverside drive stretch and made a turn back at 96th street to Sakura park completing the 5K distance. Mr. Theodrose Girma, a Physical Therapist, brought individuals impacted by autism and joined us and highlighted the family style fun walk. The group earned a nick name the Theodrose’ s Warriors. We were humbled and honored to walk with them. At finish line, Dr. Zergabachew Asfaw of New Yorker delivered an upbeat presentation about Autism and explained the challenging behavior of children with autism and the importance of supporting network that can truly empathize with them. Many people came with children to build friendship and set example of supporting children with special needs. In Ethiopia, children with this disability locked alone in their home because of social stigma associated with it. Since children with autism show difficulties in verbal and non-verbal communication skills, or social interactions more often they have been outcaste. Reports indicate that some people tend to stare and make jokes at autistic children in public places. This kind human attitude can be changed by working together and create awareness among the population by organizing this kind of event. Families with autistic children are desperately searching for moral and medical help. To address this complex and devastating disease, Ethiopians need to have effective advocacy group. Advocacy put pressure and demand the government to have active role and develop policy. In Ethiopia, there is no known national discussion about autism., ECMAA encourage our community to learn about it and show support by getting involved in campaign for this cause. As Ethiopian saying, ድር ብያብር አንበሳ ያስር” — to help and to continue to spread the word about it and ultimately to overcome the challenges presented by this condition. Thank you to everyone who participated in the Walk. Special thanks to our Guest Speaker Dr. Zergabatchew Asfaw and the Theodrose’ Warriors team.